5.0 out of 5 starsHow can you not love a book like this? There are so many books and movies about WWII, but hardly any like this. This is a refreshing take on the war from the perspective of those who dropped supplies down to the forces, and those on the ground who needed it most. I'm such a huge fan of the Author now that I've read this book. You can feel every emotion and hardship the characters endured. It is clear that the Author drew great knowledge from his extensive research, from not only his own father but other veterans too. Even though the book is set in a time and place not many of us are familiar with, everyone can relate to the fundamental basics of love, loss, fear and joy that this story evokes. This is more than historical fact/ fiction. There is action, comedy, drama, suspense and some heartfelt moments that will bring tears to your eyes. I would give this book more stars if I could, but alas, the limit is 5. I was nine years old when the Japanese attacked Pearl Harbor. I grew up in a rural area near the town of Osceola Mills highlighted in the story. Our family was not acquainted with the author's relatives as described in the narrative. However, many of the characters in the story can be recalled, especially the A&P owner who lost two sons in World War II. The town and the nearby area, with a population of about 3000, had 35 young people killed during the war. For the most part, the depth of this sacrifice was unknown except for the people who experienced it. The author has done a masterful job of communicating the personal aspects of the war and has filled a void in WW-II literature. The China-Burma-India theater has always been the “poor cousin” when it came to recognizing glory and sacrifice; but this book masterfully records a well-earned place in history. I found this book to be a compelling story about a young man's journey into WWII. 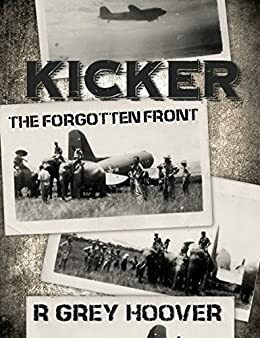 Kicker (The Forgotten Front) is a story about what was indeed a forgotten front of WWII. The book is an easy read and I couldn't put it down. I will admit that I do have a bias, as my father served in the China, Burma, India (CBI) theater of operations as a pilot flying the "Hump." The conditions described in this story certainly gave me an appreciation of what my father when through while operating in theater. While this book is a novel, it is based on true events. While my father never talked much about his experiences while flying "The Hump," however there is one event the author writes about that sounded very much like what my father told me about when he was flying Chinese troops. All-in-all a great book for those who like learning about what our "greatest generation" endured. 5.0 out of 5 starsA monumental and memorable story! R. Grey Hoover took on a bold challenge when he sat down to write Kicker. Anytime an author undertakes a piece of almost forgotten history, with the mission in mind to recapture fast-fading events, and turn it into a heart-rending novel, is brave. But that’s what Hoover did, and did it well. The CBI (China-Burma-India) Theater of World War II, although the largest in battle-zone area, did not command the spotlight of history as some other aspects of WW II. With Hoover’s in depth research, he pulls together the essential ingredients, and builds a fine piece of military historical fiction for the reader. But Hoover takes his work a major step further; he links the misery of the CBI experiences of soldiers with the anxiety and anguish of citizens back home waiting day by day for their loved ones to return home. Some did, but many didn’t. It was the era of a Gold Star banner hanging in the windows of the families that had lost loved ones to the war. Hoover takes the reader deep into the war zone and lets you feel up close the beast of war. He takes you deep in the jungles where you’ll meet more wildlife than you’ll find in any man-made zoo. And you’ll pay any price for a ticket out. But there’s a different kind of scalper to deal with. And they ain’t “scalping” tickets to a rock concert. Kicker is not a hyped version of military fiction bloated and dependent upon the coarse, salty language of soldiers under war-time stress. For me that was a unique feature that I greatly appreciated, and makes Kicker G-rated and suitable family reading. Hoover demonstrates that an authentic story can be told with civil language. As I read Kicker, I could feel the tearing and shredding of emotions between loved ones in the CBI war zone and the families back home. While bullets and bombs delivered the war, the author lets the raw human emotions of his full-sized characters carry his story all the way to the end. Hoover leaves nothing out. He shows the sacrifices made on the battle front, as well as sacrifices made on the home front. He introduces the reader to shortages of raw goods, foods, and materials experienced by American citizens. Ration stamps were more important during WW II than any trendy gadget. Jobs became war-oriented; citizens’ thoughts searched for meaning in a world aflame. When you read Kicker, you’ll discover just how significant the word “kicker” was in the war effort. You’ll come to realize that any job, task, AFSC (Air Force Specialty Code), or MOS (Military Occupational Specialty) is of equal importance. Remove one, and the mission is threatened. For most individuals war is remote, but Hoover fulfills his mission admirably. He brings the reader a spell-binding and enlightening story that should long be remembered, and he does it with the fire-power of good writing style, “top-notch brass” pacing, and with full-colors flying. And he does it with sterling word-choice, one page at a time. I commend Hoover for delivering his story with a perfect “kick.” I gladly award Five-Stars, brightly polished gold stars, for recapturing an important time in the human experience. Kicker has a permanent place on my reading shelf. I've known two veterans of the Burma/India/Hump campaigns. Neither thought their lives were worth celebrating. One was on the ground as a mule skinner with Stilwell and he told of digging holes to bury mules so the Japanese wouldn't learn of the soldier's presence. Rains completely washed away any evidence. This story brings the real cost of what my friend endured to light. The other gentleman, now 98, was an airplane mechanic forced to become a gunner when his partner had his arm shot off. One is gone now but I'm still humbled to have known them and sit in their shadows. Thank you Mr Hoover, for introducing readers to this little-known piece of WW2 and the personal drama that affected virtually everyone. I grew up the son of a career soldier, stationed at and with memories of many of the places Huber underwent training. Fort Indiantown Gap was my playground as a youngster; Pennsylvania's small mill towns, rural communities and mountains helped me grow into a young man. This book was sensory overload for me and I loved it.